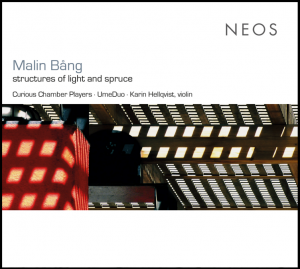 In Malin Bång’s music, multifaceted urban atmospheres penetrate through compositional structures in a seamless synergy of traditional instruments and everyday found objects, her works revealing themselves as aural field studies of urban modernity. Malin Bång is the founding member of Curious Chamber Players and Faint Noise, active both as composer and performer of acoustic objects. Her curiosity provides fuel for the most vital element of her music, the generation and sustaining of energy, often through movement and intensified friction. Curious Chamber Players perform the new version of kudzu / the sixth phase /, at Huddersfield Contemporary Festival, in Bates Mill Blending Shed, on November 21st, at 7 pm. structures of light and spruce, the portrait CD with five of Malin Bång’s chamber works, is now released by NEOS and with stunning performances by Curious Chamber Players, Umeduo and Karin Hellqvist, masterly recorded and mixed by Linus Andersson and Tomas Hulenvik at Element Studios. structures of light and spruce has been awarded the “Preis der deutschen Schallplattenkritik – Bestenliste 4/2018”. shinai kiai is a new work for choir and percussion, relating to the martial arts kendo and aikido. The piece will be premiered at the celebration of the 150 years of relations between Japan and Sweden, by the Radio Choir, percussionist Mika Takehara and conductor Fredrik Malmberg. December 1st, 3 pm at Berwaldhallen, Stockholm. A sewing factory outside Huddersfield is the starting point for a new work in collaboration with animation artist Samantha Moore and Klangforum Wien. World premiere at Eclat in February 2019. Three tunnels in Norway, chosen by the percussionists in Pinquins, will generate the sound world and the performance tools for a new percussion trio with premiere in February 2019.
splinters of ebullient rebellion was on October 21st 2018 awarded the Donaueschinger Musiktage Orchestra prize.